Special traffic arrangements will be in effect on New Year’s Eve, 31 December 2017. All of Helsinki will be celebrating together on New Year’s Eve at the Kansalaistori square. The show will be packed with music, dance and circus performances and culminate in a massive fireworks display that can be seen perfectly over the Töölönlahti bay from the Kansalaistori square. All other fireworks are absolutely prohibited in the area, so members of the public may not light their own firecrackers for safety reasons. There will be three entrances to the Kansalaistori square during the event: two along the Mannerheimintie side between the Helsinki Music Centre and Kiasma and one on Töölönlahdenkatu. All other entrances will be closed. Because of the main fireworks display, the pedestrian path through the Linnunlaulun district on the eastern side of the Töölönlahti bay will be closed from 9:30pm onwards. The stretch of Mannerheimintie between Helsinginkatu and Arkadiankatu will be closed to traffic from 9:30pm to 1:00am. Postikatu will be closed to traffic and the Elielinaukio bus terminal will be closed from approximately 22:45pm to 1:45am. Most of the affected bus services will operate to the Mäntymäki bus terminal. There will be extra bus, tram, metro and local train services during the night. Further information about affected routes and public transport schedules on New Year’s Eve can be found on the Helsinki Region Transport website. Helsinki’s New Year’s Eve show will be hosted by Jenni “Jenspa” Poikelus and Alma Hätönen from radio YleX. Mayor Jan Vapaavuori will also deliver a speech. A live broadcast will be shown on Yle TV1 (and not Yle TV2, as previously reported) from 11pm to 1am, including the main show, the fireworks display and the atmosphere in the Kansalaistori square afterwards. 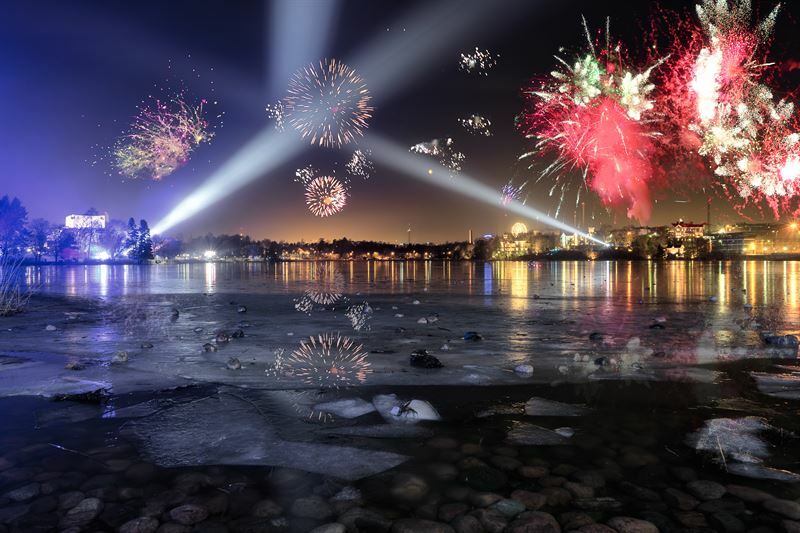 Helsinki’s official New Year’s Eve celebrations are organised by the City of Helsinki. This traditional event has been held since the 1930s. The event is coordinated by Susa Nokelainen and Marianne Saukkonen from Helsinki Marketing.